Retail sector in India has two sections. There’s organized retail sector and unorganized retail sector. As one would expect, in a third world economy, the unorganized section holds the larger share of retail market. However, here we have tried to list down top retail chains in India, listed their prime banners and look at their annual turnover and profit figures to put perspective into the Indian retail industry. One of the first malls in India, Shoppers stop pioneered the era of a luxury shopping experience in India. 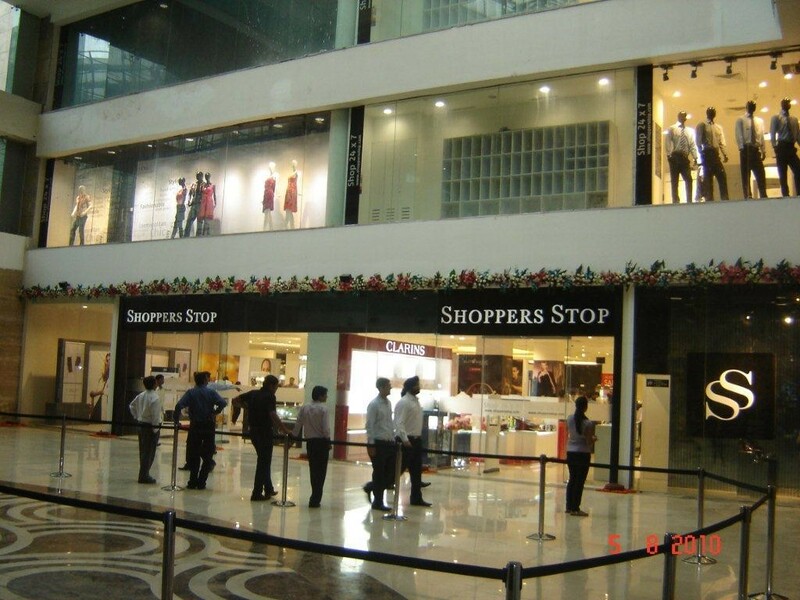 Started in Mumbai in 1991 from a 4000Sq feet store, today Shoppers Stop is amongst the top Indian retail chains. The BSE and NSE listed Shoppers Stop has 74 stores across 35 cities in India and employs over 14,000 people. Shoppers Stop specifically sells retail clothing, accessories, handbags, shoes, fragrances, cosmetics, health and beauty products, furnishing and decor items. Crossword, HomeStop, Brio, HyperCity, M.A.C, and MotherCare are Shoppers Stop’s sister stores, to name a few. Shoppers Stop’s annual revenue is close to INR 3780 crore or USD 0.54 billion. Reliance retail is a part of the Mukesh Ambani owned Reliance industries. As per the latest financial data in 2016, Reliance Retail’s annual revenue is about $2.3 billion or Rs. 16,000 crores and profits of over Rs. 400 crores.. Its retail outlets sell food, grocery, apparel and footwear, lifestyle and home furnishing products, and electronics. Its range of offers are diverse, but mostly focused on consumer goods and durables, entertainment and leisure, health and well-being, energy, travel services and educational products.Reliance Retail operates 3,383 stores across 679 cities with an area of over 13 million square feet, as of June 30, 2016. 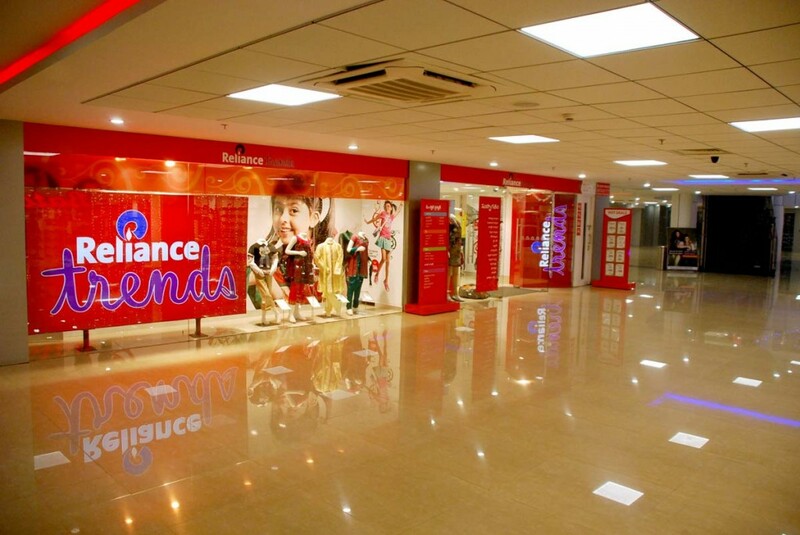 Amongst the major brands under Reliance retail are Reliance Fresh, Reliance Digital, Reliance LYF, Reliance Jewels, Reliance Time Out, Reliance Trends and Reliance Market. Future Group is the corporate name behind retail giants like Big Bazaar and India’s first and largest independent homegrown pure-play retail group. Led by entrepreneur Kishore Biyani, Future group is a private conglomerate, based in Mumbai. 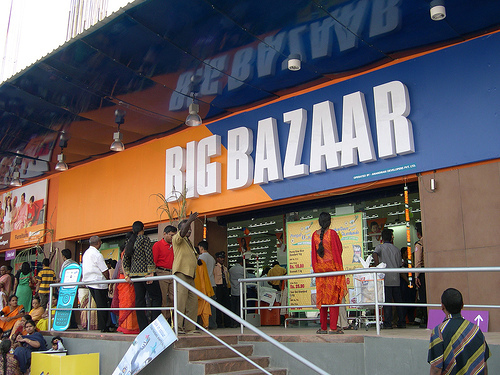 Other than Big Bazaar, some of the other big names under the Future Group include FBB (Fashion @Big Bazaar), HomeTown, E Zone, Foodhall, FutureBazaar.com, Easyday, Nilgiris 1905. The company posted a consolidated income from operations of ` 13,897 crore and an operating profit or Earnings before Interest, Taxes and Depreciation (EBITDA) of 1,251 crore for the fifteen months ended March 31, 2014. 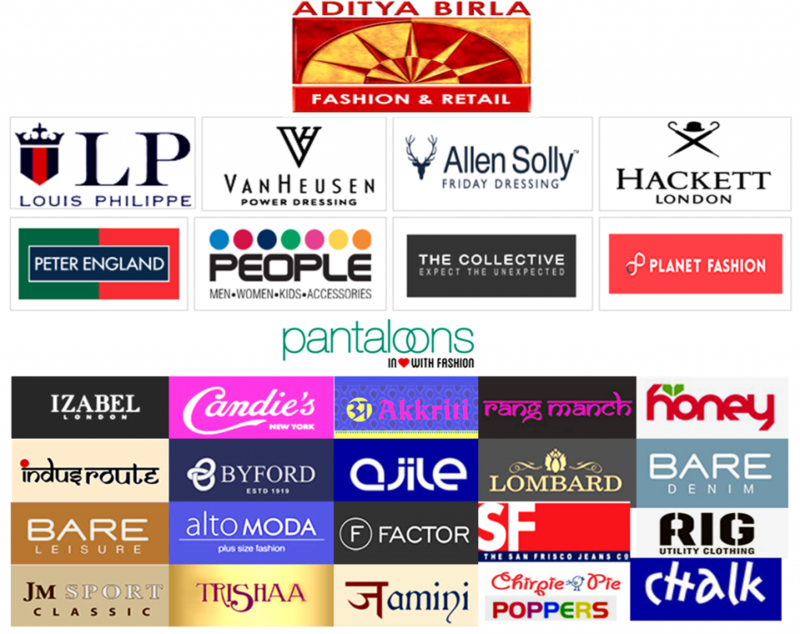 After acquiring Pantaloons Fashion (earlier owned by Future group), the the combined entity of Pantaloons and Madura fashion and lifestyle, Aditya Birla Fashion Retail Ltd. (ABFRL) is the largest fashion retail chain in India. The BSE and NSE listed ABFRL clocked a combined revenue of INR 6,060 crore (or USD 0.84 billion) for FY’16 and an EBITDA of INR 409 crore. The stores under the ABFRL now include Pantaloons, and Madura Fashion And Lifestyle brands like Allen Solly, Peter England, Louis Phillipe, People and Van Heusen. ABFRL altogether hosts India’s largest fashion network with over 7,000 points of sale across over 375 cities and towns, which include more than 2,000 exclusive ABFRL brand outlets. Tata Group is a multinational conglomerate founded by Jamshedji Tata in 1868. Among their wide range of subsidiaries and line of products, Tata has a prominent presence in the retail industry across verticals as well. 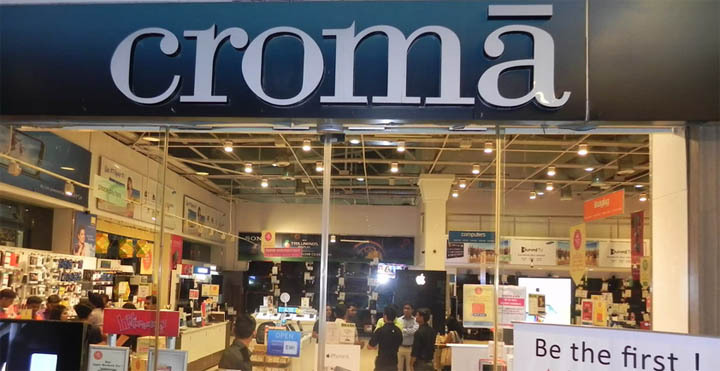 Cromā, Titan, Landmark Bookstores, Starbucks, Tanishq, Westside, Star Bazaar and the newly launched Tata Cliq are the most famous names under Tata’s retail umbrella. While the financial statements for TATA retail are unavailable, The total revenue posted by the Tata Group for the year ended March 2016 was Rs. 677,556 crores or USD 103 billion.